Highlights: I walked for two weeks. Julie was here hanging out for a week. And we visited Heather and Jodi in Minneapolis. It was that sort of month. A trip to the Emergency Room has eluded me my entire life. I have never, to my memory, been rushed to the hospital for this or for that. 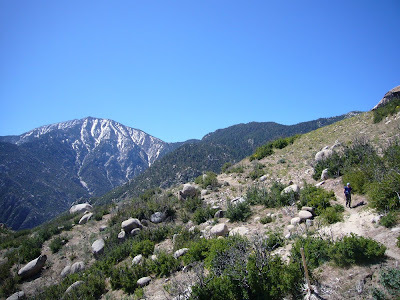 Our unexpected last day on the trail started at nine thousand feet, near the peak of San Jacinto. We woke up early, hoping to get a head start on the sun. 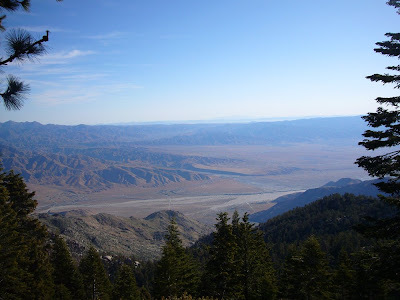 The news from the locals in Idyllwild was that the desert floor, where we were headed, was to reach temperatures above one hundred degrees. The news from the locals was always bad news. "You've got a storm headed your way." 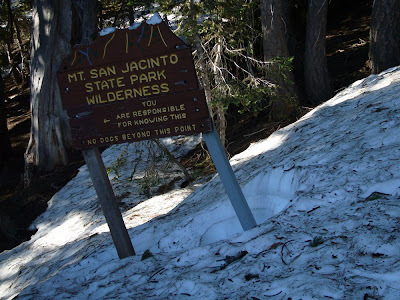 "Watch out for the mountain lions. We have plenty of them in these parts." "Hope you can find the path in that burned out section." "Get ready for fifty mile an hour wind gusts up there tonight." Thanks for the news, I always said. So we left mile 187.3 at 5:15am and started walking. 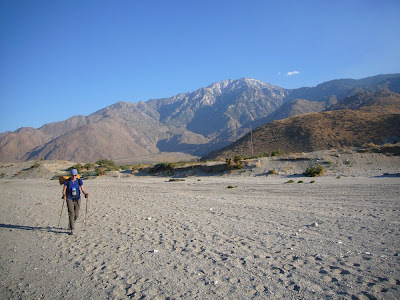 We slowly, ever so annoyingly slowly, lost altitude until we finally reached the desert floor, some eight thousand feet below our starting point. By two pm, we had hiked twenty miles and found ourselves at our water stop. There was a large boulder there, and we both huddled around it for some much needed shade. Since we walked alone much of the day, we traded stories under the rock about how much we hated the days descent. I spoke of cursing flowers and she spoke of yelling at mountains. It was that kind of day. We sulked and ate for three hours under that rock. We left at 5pm, refreshed but still hot, and headed toward Interstate 10 just a few more miles away. 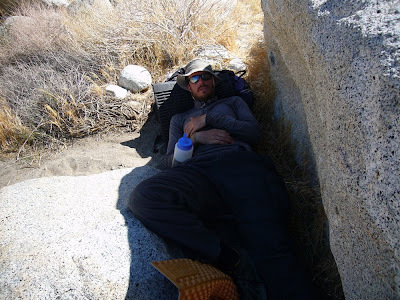 Underneath the freeway, we happened upon two hikers who had set up camp for the night. We chatted for several minutes, keeping the conversation going only for as long as we needed the shade. They spoke of some abandoned cabins just up the trail, maybe a mile away, that we could camp at for the night. So we headed out, relieved to be near the day's finish line. But thirty minutes later we were in a Mercedes Benz, whizzing down the freeway at speeds of ninety miles per hour. I lay in the front seat, wheezing and trying to stay conscience. At the Palm Springs Medical Center ER I collapsed into a wheel chair and was rushed to a bed where I was hooked up to oxygen, IV's and heart monitors. I laid there for six tedious hours, getting tested, giving blood, getting pictures taken of my chest. The final analysis of what happened to my body was unclear, but it was probably a heat stroke or most likely an electrolyte deficiency. (Believe it or not, a close friend of mine suffered the same fate at the exact same place on the trail a few years back.) Whatever the case, I was told to rest, rest, rest. So just as it was getting past 1am, Julie and I walked slowly out of the hospital and into a motel room where we reunited with Kari. I fell asleep thinking of the abandoned cabin, only an imagination to me now. In the end, after a series of discussions, we opted to get off the trail. 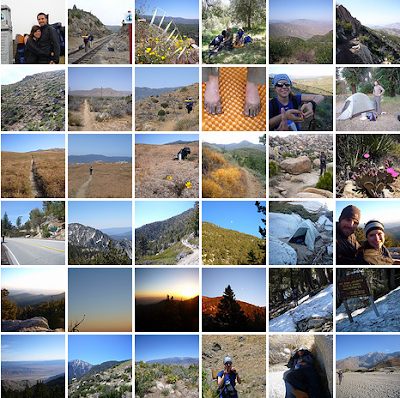 We walked for two weeks and 210 miles, from the border of Mexico to Palm Springs. Though it was less time than I spent walking on the Appalachian Trail, it was the most miles I have hiked in one go. Julie and I shared an incredible adventure out on the trail - experiencing all that we could have hoped for in a walk through the desert. And we salute the men and women we walked with along the way - those who are still walking and will still be walking in September.